Coiling is an age-old pottery technique and one of the easiest to create. It’s simple yet brilliant at the same time. If you ever did pottery lessons at school, then this is likely the technique you will have used to create your pot. The technique is centuries old, and its roots lay in Japan in the Jomon period. Jomon pottery (which uses the coil technique) is said to have been first found in around 10, 500 BC, although some pieces that archaeologists have found date as far back as the 14th millennium BC. The history and roots of coiling in Europe are said to lay in Greece, where it became popular around 2500 BC (this was also around the time that the pottery wheel was introduced in Greece). Coiling was later popular across the globe in China, Africa and Ancient North American civilizations. Luckily the technique is still going strong and being passed down through generations. Jomon pottery is a beautiful type of coiling pottery that was discovered in Japan during its Neolithic period. Jomon means ‘rope patterned’ and as with coiling was built up from the bottom using coil upon coil (with materials like fibers and crushed shells worked in to hold the pot together). They were usually fired on a bonfire at around 1, 652 degrees Fahrenheit. The pots were unique and easily identified, as they had ‘pointed bottoms and rudimentary cord markings’. Jomon pottery was almost always used for cooking purposes, for example boiling food above a fire. The coil method is one of the most popular ways to make a large pottery vessel because it allows you flexibility when you are making the piece and the work is very stable as you are building it up coil by coil. You can also build your pot up very slowly and with complete control. The slow pace is also incredibly therapeutic. It’s often easier to use a flat coil when making a larger vessel, so you can begin by rolling out a huge slab of clay. You can use stoneware or earthenware clay for this. A good tip is to roll the clay out around ¼ inch thicker than you would like the width of your pot to be. The reason for doing this is that you will be smoothing the pot down a lot with tools afterward and this will make the walls thinner. Then cut the coils into pieces around two inches wide. It’s your choice whether you would like to make your pot the right way up or upside down, they’re both easy to achieve. If you’re making your pot the right way up, you’ll need to cut a thick base from clay to join your coils to first. If you’re putting the base on last and turning your pot up the right way, you can save that until the end. If you’re making the base first then roll out a slab and cut a large circular shape from the clay of your desired size. Making sure that your coils are attached firmly to your base is really important, so score lines with a knife (almost feather-like indents) right around the base and then use a slip to carefully attach your first coil. Then just keep working round and round and building up the levels of your pot. 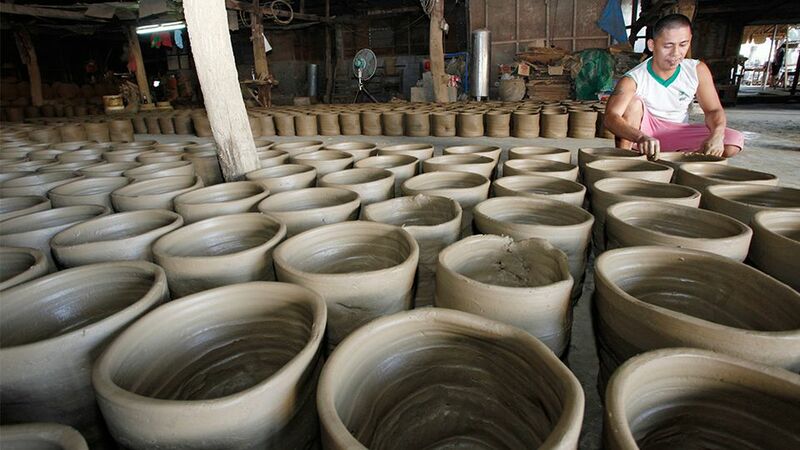 The beauty of this method is that you can make your pot as large as you desire. If you’re making a huge pot then let the first rows of your coiling dry to leather hard (keep it wrapped in plastic so it doesn’t dry out completely during this process), before continuing to build upwards. When adding the next rows of coils you’ll need to have enough slip or slurry to join the coils together to the first part of your pot. It’s best to put the pot on banding wheel while you’re working so you can turn it around and round easily to attach your coils. Another tip is to put plastic inside the pot while you are working, this should keep in the moisture while you are building it. Throughout the process smooth the outside of the walls with a damp sponge and a rib and make sure you cannot see any of the seams.